Try and unlock the mysteries of the pyramids in Legend of Cleopatra, a 6 reel, 100 payline slot from Playson. Look out for stacked wilds that can duplicate on a second reel and a bonus round that awards up to 30 free spins. Play on all devices from between 20p and £100 per spin. The design here is nicely done – the reels are set against a bathing chamber within Cleopatra’s palace. You’ll see lower value playing cards alongside the bird god Ra, the cat god Bastet and the dog god Anubis. These all pay 2.5 times your total stake if you land 6 in a line. The best paying standard symbols are Cleopatra and the Legend of Cleopatra logo which pay 3.75 times your stake if you land a 6-symbol combo. They’re joined by a golden wild which replaces everything bar the scatter and pays up to 5 times your stake per payline. 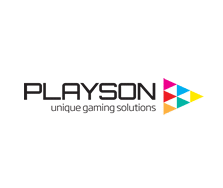 Standing out from the crowd can be a difficult business for a developer creating a slot with an ancient Egyptian theme – Playson has done it by building an unusual game engine. The action takes place on a 2x3x3x4x5x5 reel set which adds up to 100 paylines. The 4-high reel is edged in gold – if you manage to fill that reel with a stacked wild, you’ll trigger the Double Wild Reel feature. 1 reel is chosen at random and filled with wilds to give you 2 fully wild reels – a new payout is made with the stacks of wilds in place. The second feature is the Free Spins feature – land 3, 4 or 5 of the scarab beetle scatter (which hits on reels 2-6 only) and you can look forward to 5, 10 or 15 free spins. During this feature, the shape of the reels is reversed into a 5x5x4x3x3x2 formation. Landing 2 scatters adds 2 more free spins to your total – find 3, 4 or 5 and it’s another 5, 10 or 15 free spins giving you 30 in total potentially. With its unusual reel set up, Legend of Cleopatra looks like it could be a complicated play. In fact, it’s very straightforward. The visuals are well done and the haunting soundtrack is a good fit. The range of extras is fine too without being especially innovative. It doesn’t really stand out in the crowded Egyptian-themed genre but Legend of Cleopatra is a perfectly solid performer and worth a spin if you enjoy the ancient theme. If you like the theme and want something unique, WMS’ Lady of Egypt offers you just that.